What is the contributor functionality? 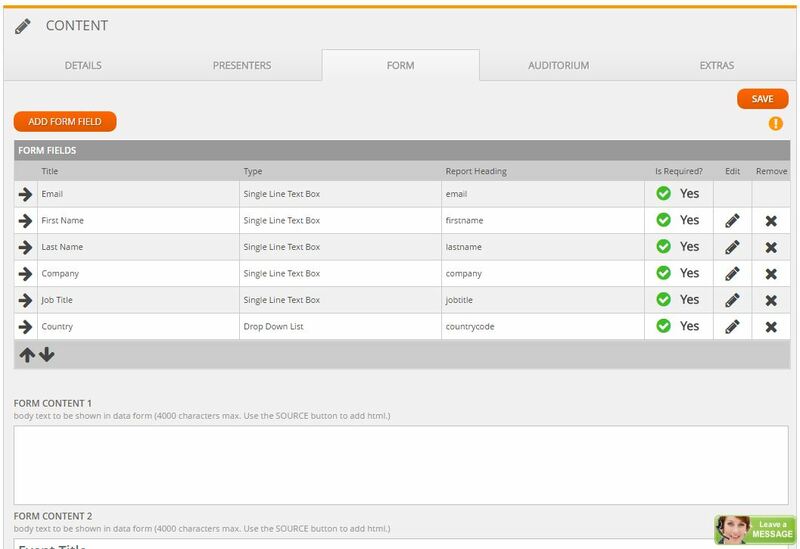 Contributor is the process whereby our clients submits their event content to WorkCast for a Managed Event booking. The client can preview content on their pages within their templates prior to submission to WorkCast, meaning you are able to see how pages will look once finalised. We aim to provide you your registration URL within 1 working day after content is submitted to WorkCast. Enter your date into the 'Title' section if not already populated. Save your progress by pressing the 'Save' button. You can either add an existing presenter or create a new presenter profile from scratch. You cannot edit an existing presenters' profile which has been created by different users, although this can be completed by a WorkCast member. Please ensure uploaded presenter images are sized at 80x80 pixels. Adding registration fields and content to display on the live Registration page. Form Content 1/2/3 can be used to add text/images/links. You are able to preview the Registration page in order to see the layout of the page after making an edit and clicking 'Save'. Do not copy and paste from a Word document or any other program into the box. This will pull through code from the applications which will result in text not displaying correctly and also reduce your allotted description box word count. You can ensure no extra code is pulled through by clicking within the Form Content box, selecting the 'Source' menu option from the WYSIWYG and pasting text into the popup box. Click OK and use the WYSIWYG to format your text, e.g. bold, italic, bullet points, colours etc. 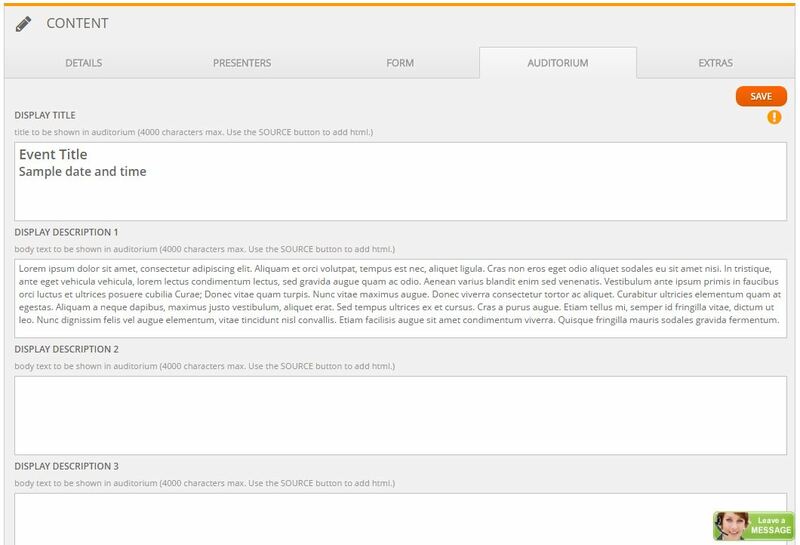 Adding content to display on the live Auditorium page. 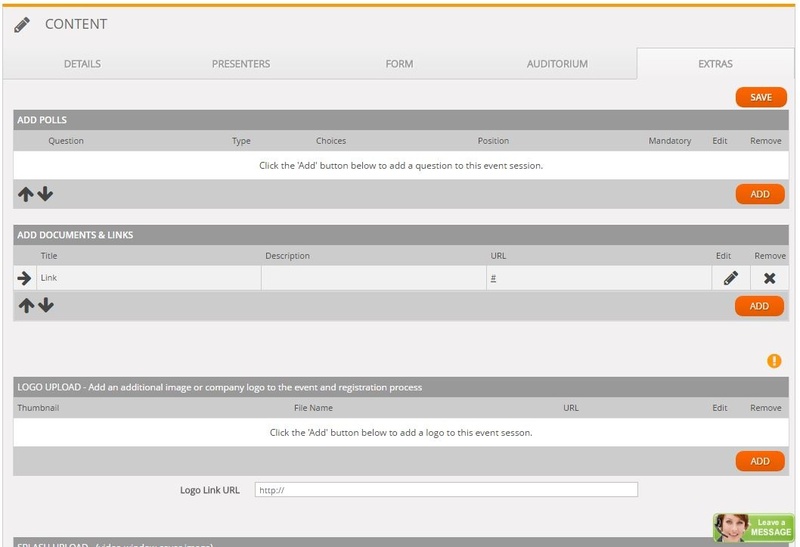 You are able to preview the Auditorium page in order to see the layout of the page after making an edit and clicking 'Save'. The same rules apply as Step 3 when adding content into the boxes. Documents and links - these will appear in your auditorium under the 'Resources' section, (user clicks on these are tracked within the platform) These can be added as external links and range of different document types such as PDF, Word, PPT, etc. Logo upload - for adding a sponsor logo to your event which will display on both Registration and Auditorium page as well as email communications. (Recommended maximum width of 280px). Splash/Holding image for media - the image which appears in the media player when your Auditorium is not broadcasting. A account default image will have been set up by us, however this can be changed per event basis. - 16:9 aspect ratio JPEG or PNG image (recommended size: 850x478 pixels). Once everything has been added and you have saved every page, a 'Submit for Approval' button will appear. You can choose to submit certain sections or all sections at the same time. You can also add comments, for example, if you were unable to add a certain element. After clicking 'Proceed' to submit the page for approval, WorkCast receive a notification and will see any added comments. Throughout Contributor, you can click ‘Preview Form’ and ‘Preview Auditorium’ to allow you to view your page whilst making edits. This allows you to add further edits/corrections before sending to WorkCast for approval.